Doing the same workout routine over and over again can be tiring and boring as well. In a worst-case scenario, you may end up losing your motivation to get fit. Are you looking for a way of spicing things up? Then, you should try out trampoline workout, also referred to as rebounding. Trust me; using trampolines is not just for kids to prop up during their birthday parties or for fun times in the park. If you thought so, then you are absolutely wrong! Rebounding on a trampoline is an effective exercise that’s capable of helping you lose weight and get back into shape. When you do an exercise that you enjoy, then you will likely start to realize better results. Trampolining works just like an anaerobic and cardio workout to increase heart rates and strengthen body organs. The more you continue to dispense energy on the trampoline, the more weight you lose, thus a leaner you. But the burning question is this, how much weight will you lose after 1 month of playing trampoline? Here is a plain truth, apart from a healthy diet; cardio training is the other means of a sustainable weight loss. If you are thinking of losing some weight without activity, then you need to think again. Engaging in such practices puts you at risk of melting too much muscle mass. Also, a successful workout is one in which you do not over-exert yourself. Jogging and trampolining are such exercises that facilitate fat loss from the muscles. Part of the reason why rebounding on a trampoline is sustainable is that your breath replenishes the oxygen used by the muscle cells. Therefore, at no time would you overwork your body. Then, there is the possibility that you are a workout newbie. If you are in this context, starting your training light is the key to not giving up on your workout. That’s why trampolining for a couple of minutes per day is recommended to optimize on your well-being and health. Should you Jog or use a Trampoline? Jogging beats quite some exercises when it comes to efforts applied, and benefits realized. I think it is how simple jogging is that even I can’t resist the urge for a 30-minutes session every day except on weekends. All I need for the workout is a pair of designated running shoes. Even so, this type of cardio exercise is too strenuous for a good number of people. Waking up in the morning and bringing yourself out of the house for jogs sounds like too much effort to make for some people. If that’s so, then trampolining is the ideal option for the fitness enthusiast, yet busy you. If you own a mini trampoline in your house, then you will be having a 2-in-1 advantage inducing fitness activity. The genesis of the benefits is from studies conducted by NASA. These studies concluded that rebounding for at least 20-minutes a day yields better training results than a 30-minutes jogging session. In short, according to these NASA findings, you are better off trampolining than jogging. To this effect, the organization emphasizes rebounding among the astronauts to train muscles and build on endurance. That’s two benefits from a single workout activity. After spending almost 2 weeks in weightless conditions in space, the astronauts recoup about 14 percent of their muscle mass that was lost. Want to be cool like astronauts? Well, take up one of their favorite workout routines which is a fantastic way of getting lean, even on water. Another reason to take up rebounding is its low-impact nature. This low impact strength and cardio workout alternative absorbs almost 80% of the shock that would have been felt by your knees and joints. As a result, a person between the age of 2 and 99 years can rebounce. If you had excuses of not going outdoors for an exercise, you can still stay indoors with your family and work your way to full-body fitness. 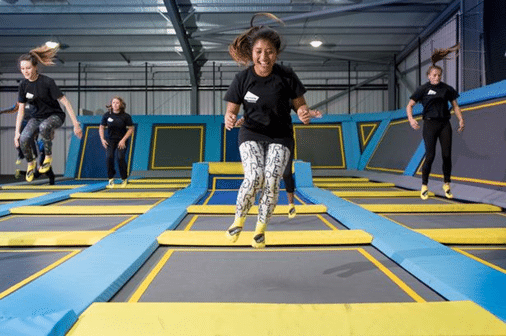 How Many Calories Can You Burn in an Hour of Trampolining? The question as to whether a trampoline actually blasts fat has lingered through the minds of many people. While the number of calories burnt is varies, what is clear is that this form of exercise does help you lose weight. According to some trampoline gyms, an individual can burn as many as 1,000 calories in an hour of jumping up and down a trampoline. Putting this into perspective, running for 10, 6 minutes per mile jogs would yield the same number of calories. The number may seem high, but trampoline gyms are usually more intense than your typical in-house trampolining session. These sessions are considered as High-Intensity Interval Training (HIIT) workouts, thus believed to burn a maximum of 500 calories every 30 minutes. This means that if you go for a 1-hour workout, then you will have burnt 1,000 calories. Of course, this figure is not constant and depends on the individual’s weight and performance characteristics. On a separate study, it was found out that men burn an average of 11 calories while women torch about 8.3 for every minute of trampolining. If you compute the math for an hour based on these stats, then men would have dispensed 660 calories while women 498 calories for an hour. The number of calories burned depends on how intense your workout session is and your weight. Engaging your arms, jumping higher or running about on the mat increases the number of calories dispensed per hour. Based on data I retrieved from various calorie calculators, an hour of jumping burns between 130 to 240 calories for a 150-pound person. But then again, these calculators aren’t known for their accuracies. However, the results can give you a great indicator of how much weight you can expect to lose in a week. Since calories are stored in fats, torching up these fats essentially uses up the fats, thus reducing your weight. Fewer fats in your body mean reduced weight. Hence, the basics of weight loss through trampolining comes down to the calories you burn is more than those that you take in. If you want to shed weight, eat fewer calorie-rich foods and then hit the trampoline. On an average, 1 pound (0.45 kg) of fat in the body packs about 3,500 calories. From this relationship, if you burn the same number of calories, then you technically lose the exact number of pounds. So, if your trampolining session burns the average of 500 calories per hour per day of trampolining in the gym, then it takes you 7 days to scorch the 3,500 calories. That translates to 1 pound loss every week, then 4 pounds lost per month. But if you burn the 1,000 calories I had mentioned earlier, then expect to lose about 8 pounds per month on the higher scale, provided you maintain the same level of calorie intake. Also, the process seems simple and straightforward, while in reality, it isn’t. It is not only fats that are lost when you exercise. Also, lean tissue and water are also lost. Likewise, the body itself undergoes through a lot of changes that may necessitate that you further cut down on calories if you are to lose a steady stream of weight. There are several exercises that you can perform on a trampoline as you have fun. Because of the low impact nature of the exercise, you can vary the options as much as you want, provided you remain mindful of the persistent danger that exists with trampolining. Before you start any workout session, you have to warm up. Stretching your body forms part of this warming up that’s even recommended by health professionals. It reduces workout-related injuries. As you start bouncing, stretch out your arms at the same time. Hand movements are exercises that you can modify as much as you can. Alternate between overhead stretches, then have the hands in front of you, then repeat. This exercise is more interesting than the one in which you were rebounding on the trampoline. You don’t always have to be rebounding on the trampoline. Take this exercise for example. It involves using the mat as your prop support. For this, lie flat on the ground, while your legs rest on the trampoline mat. While comfortably in position, lift your legs up and down for a couple of minutes. While a trampoline is a great substitute for jogging, it doesn’t mean you shouldn’t jog on it if you hate going outdoors for the same. Plus, the elastic mat would be absorbing most of the impact as your feet land on the surface. To mimic an aerobic workout and elevate your heart rate, jog up and down as you alternate your arm position. If the right leg goes up, then the left arm goes down, and vice versa. Continue jogging for 3 minutes straight, then take a 1-minute break as you catch your breath. Proceed with another 3 minutes before you can revert to another exercise. This is the usual rebounding that your kids enjoy all over the place. You jump up and down on the mat for a period while giving yourself time to recover, then proceeding. It’s a lot of fun that imparts great health benefits for you. Make things more interesting by adding kicks into the bounce. The kicks are not as simple as it sounds and will take a lot of toll on your body, which is the aim either way. So, how much weight will you lose after 1 month of playing trampoline? The number of calories burned during a trampoline session differs from person to person. Facts depend on weight, workout intensity, and calorie intake balance. However, the fact still remains that you will eventually lose some weight. Figures of calories burned can be measured with the help of online calculators or if you have a fitness watch, the better. Factor this figure for the duration of the week, then extrapolate for the whole month. The results should give you an insight into whether your trampolining is just for fun or a serious weight loss workout. Trampoline weight limits – How much weight capacity can a trampoline hold? 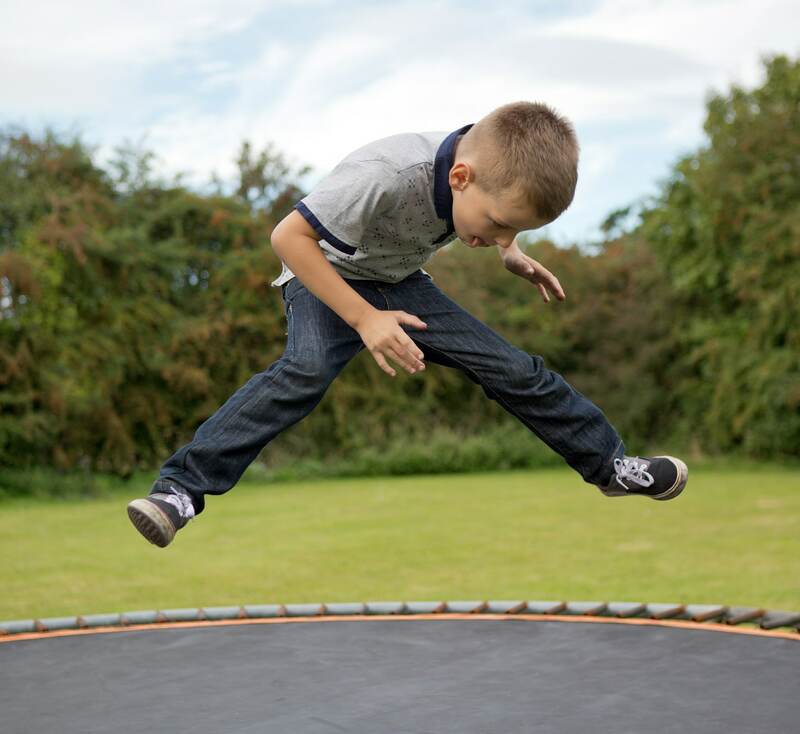 The Safest Trampoline: Which One is Right for You?